I don’t feel things have changed that much in the past year as much as I’d hoped. I’m still working on increasing my client base. I have some things in the pipeline and am hoping for some good feedback on a large job I have coming in soon. One big change which actually occurred this summer is that I’m breaking up a working relationship with a joiner I’ve been working with. I’m taking a chance of dropping the client because the work really doesn’t suit my skills. This way I’m giving myself more time to devote to work that will stretch and improve my skills. I’ve learned that taking on a job that’s not really in my field just because it pays is not always a good experience. By stepping outside my comfort zone I’ve learned new skills and how to transfer the skills I have, but on a couple of occasions I’ve really regretted not trusting my initial instincts and have wasted a lot of time worrying over jobs I shouldn’t have started. About a year ago I took on a client that was pretty toxic. If I could go back in time I’d definitely make sure I told myself not to be so trusting and set a very short limit on working with outstanding payments! Take time to assess each and every job before saying yes. Even if it’s from a client you deal with all the time, if the job is not what you feel comfortable doing just say no rather than worry about it after you’re committed. Remember to give the customer what they want, nothing more and definitely nothing less, if you can’t do that then don’t take on the job. I’m really not sure. Permanent workshop space is an issue and I think that’s something I need to look at, however relocation back to the north of England is niggling away at the back of my mind, we’ll see. It looks like some good lessons learned there. It is often a few years in to a business that a) you start to look more carefully about which clients and opportunities to say yes to, and b) you start to explore diversifying and looking at new areas to grow into – but as Julia comments, it is vitally important to make sure that you assess those opportunities and check whether it’s something that you want to do again. I wonder where Julia will be in another year’s time – both with her business and her location! I’m looking forward to finding out! 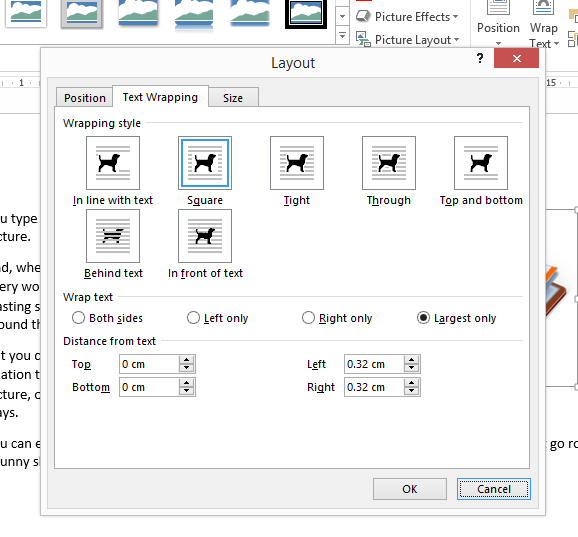 One lets you control the size of your picture, but there are easier ways to do that (see How do I change the size of pictures in Word? on my website). The other, Position, provides some detailed options for controlling where your pictures go and is the key to stopping them from jumping around. It looks complicated, but I don’t think I’ve ever, in years of creating worksheets and doing magazine layout, had to resort to changing anything in the sections labelled ‘Horizontal’ and ‘Vertical’ – I’ve just used the ‘Options’ section. Before we go on to that though have a look at the ‘Allow overlap’ button. This is useful if you want to get two pictures closer together than their boundary boxes would otherwise allow. For example, here you can see that although the books themselves don’t overlap, the boxes round them do. Notice also how the Tight-wrapped text goes inside the boxes because these images have a transparent background. Why do pictures move? How do I stop pictures moving? Basically, pictures can either be locked in position on the page or moved around with the text. 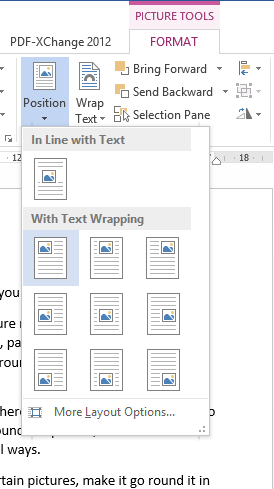 In Word 2013 ‘Move with text’ and ‘Fix position on page’ appear as options on the Wrap Text menu and on the little pop out Layout Options menu (so long as your picture isn’t in line with the text). In earlier versions you have to go into More Layout Options|Position and check or uncheck ‘Move object with text’ – it’s checked as default. 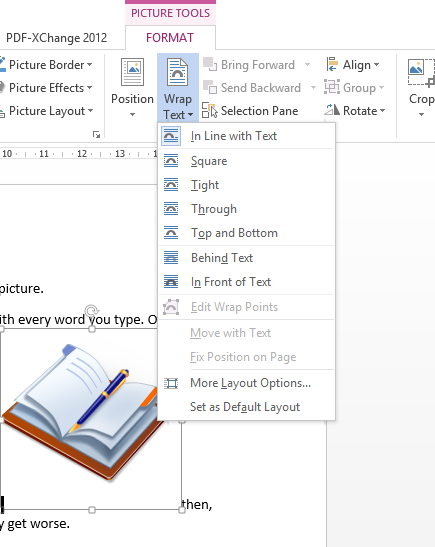 If you have a picture exactly where you want it on a page, all you have to do is uncheck the box (or make the appropriate selection from one of the menus in Word 2013). That picture will then stay exactly where it is when you edit or add to the text or insert another picture – it will move only if you grab it and place it somewhere else yourself (or play with the numbers in the ‘Position’ tab of More Layout Options). Allowing pictures to move with text is a little more complicated and depends on understanding the idea of anchors. 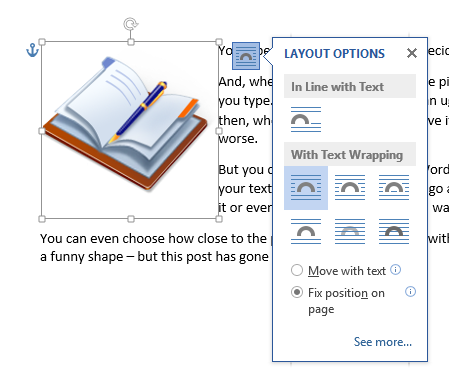 When you whizz a picture around the page, Word makes a decision about what text to tie it to: it generates an ‘anchor’, usually at the beginning of the paragraph nearest to the top left corner of the figure (working up). If you then move or delete that bit of text, the image will move or be deleted with it — that’s why pictures sometimes vanish unexpectedly. They usually jump because an anchor and its picture have to be on the same page. That means that if you type an extra paragraph and the anchor moves to a new page, the picture will jump to that new page too. It’s Word trying to be helpful, aiming to keep pictures and the writing about them together, but it does feel pretty random if you don’t know the logic. 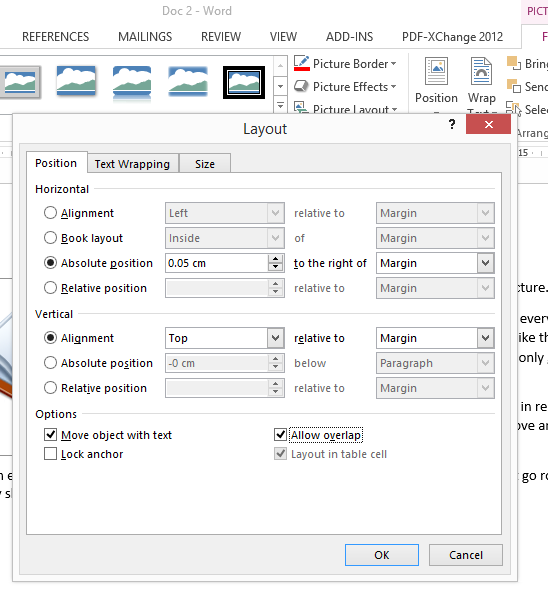 Word 2013 helpfully shows you the anchors whenever you’re clicked on a picture, but it is possible to see them in earlier versions: since they are formatting marks, they will show up if you click the symbol that looks like a backwards P in the Paragraph group on the Home ribbon. If you can see them, they can help you work out why a picture won’t go where you want it or keeps disappearing altogether. In Word 2010 or 2007 you can also get the anchor marks to show all the time (without the other formatting marks) by going to File (Office button in 2007)|Options|Display|Always show these formatting marks on the screen, then ticking ‘Object anchors’ and OK.
Write and type all the text first (or work a page or two at a time). If possible, get the pictures as close as you can to how you want them (size, resolution, cropping, colours) before you add them to your text – either use image editing software or get it right in a blank document then copy and paste into the one you’re working on. Once you have a picture where you want it, with the right sort of size and wrapping, consider locking it in place. If a picture that has to stay with the text appears to be misbehaving, go in search of its anchor to track down the problem. Still can’t get the pictures where you want? If you’re creating something with a lot of images, or need more complex layout — such as for a brochure or worksheet — then there are alternatives to putting the text and pictures straight into the document. I explain how to use a table to combine text and pictures in How do I organise a lot of pictures on a page? over on my own blog where, in future posts, I will look at alternative solutions, and other issues to do with using pictures. Welcome to another Small Business Update, and it gives me great pleasure to publish my second update post with fellow editor Tammy Ditmore of eDitmore Editorial Services. We first met Tammy back in June 2012, and read about her growth and achievements in June 2013. At that point, here’s where she was thinking she’d be by now: “I’m not quite sure, actually. I feel I’ve taken initial steps in several different directions that may pay long-term benefits. I’m hoping to remain flexible enough to pursue the best opportunities that come along—let the business grow more organically, to use a bit of jargon. Even though I’m not quite sure what eDitmore Editorial Services might look like in a year, I feel confident that I’m on a good path and am looking forward to what this next year will bring.” So, where is she and how’s she doing? Hi, Tammy! Are you where you thought you’d be when you looked forward a year ago? Well, a year ago I didn’t want to predict where I would be, so I have to say that, yes, I’m right there! Seriously, my business has continued to be steady, and I continue to gain clients from expected and unexpected places. I am usually booked several weeks in advance, even though I’m not doing a lot of active marketing, which is good. The downside is that I’m often overbooked, and I wind up working long, frantic hours to finish everything by the clients’ deadlines. I think for the most part things are pretty much the same. I’m still thrilled to get to work on a wide variety of projects. This year I added some new clients, including working on a federal grant application for the first time. I also got a chance to speak to several groups about editing, and I enjoyed that experience very much and discovered I would like to do more of that in the future. I recognized earlier this year that the majority of my clients have come from word-of-mouth referrals from friends, co-workers, and clients. So I feel if I keep pleasing my clients, then my stream of work will probably stay steady. A lesson I have been learning, and continually re-learning, is that I can’t do everything. There is always more to learn, more people I could talk to, more social networks I could join; there are better ways of recruiting clients, better computer apps and programs that might make my life easier, more productive habits I could adopt. But I find myself getting so wrapped up in trying to make everything better that I actually make it harder on myself just to do the work that is in front of me. I was really surprised this year when I stepped back and analyzed where my clients had originally come from and saw how many of them were from personal contacts. (I wrote a blog post about my findings if anyone is interested.) Since then, my advice to any independent business owner is to tell everyone you know what you’re doing and ask them to keep you in mind if they hear of anyone looking for the kinds of services you offer. Some of my favorite clients have found me from what I would have considered very unlikely sources. Probably in about the same place as I am today. I recently stepped back and took stock of my current family and life responsibilities, and I realized I just need to focus right now on keeping my business steady so that I have the time and energy to take care of these other obligations. I do have some dreams for expanding into other areas at some point, but I don’t think this will be the year for that. Admitting that I needed to take a step back — or at least not try to move forward — was hard at first, but it’s given me a greater sense of peace and helped me focus on what’s most important to me right now. I believe there are seasons to life, and I don’t want to miss this particular season by trying so hard to launch myself into the next one. Tammy’s only about 18 months “behind” me on the freelance editing journey, so I always find her updates very interesting. I urge you to go and read her post about where she’s found her clients – very interesting. It was at about the point Tammy’s at that I took stock, too – I recommended some clients transferred over to colleagues as the way they needed me to work and I wanted to work didn’t gel any more, and I have a much more relaxed and flexible life now, with slightly (but not much) less income but much more time. I wrote about how to achieve that balance here. Update: Tammy wrote a lovely blog post of her own about the process of doing these interviews! Welcome to another Small Business Update. Today we’re catching up with two interviewees, Diane Grogan and Pat Wilkes, to see what they’ve been up to during the last year. Diane’s had some hurdles to face this year, but has taken them on, moving premises to cut costs and helping her volunteer staff to get qualifications and stay with her long term. Reading between the lines, Pat has also faced some issues this past year, but she’s steadily evaluating what works and what doesn’t (a vital task in those early years of a business) and is pressing on with her plans, too. Craft-orientated readers will find her points particularly useful. We first met Diane from Kanine Kampus and Pet Au Purrs, a dog day-care centre in Oldham, in May 2013 When she was asked where she planned to be with the business in a year’s time, she had fairly modest ambitions: “I hope that the business keeps growing and we could maybe have another branch of Kanine Kampus in another area.” As I said above, Diane’s had some setbacks this year, but she’s moving onward and keeping going, and has some good advice for those readers who are committed to using premises rather than a home-based office. Hi, Diane! Are you where you thought you’d be when you looked forward a year ago? We have had quite a few setbacks during our first couple of years trading, such as higher than average costs due to business rates electricity etc, so this has slowed down our venture somewhat, we moved premises to cut costs and are still playing catch up, and this has had an impact on where we though we would be by now. We have taken on more staff than expected, due to having some wonderful volunteers who we didn’t want to lose – we have managed to get them onto some free training programmes with a fantastic company called Keyed Up Training. All our volunteers are now on animal care courses and have all completed other courses in Cleaning principles and Customer services. Think twice before putting any money into advertising, it’s really not needed. Facebook and word of mouth have been our lifelines. Look at all the options and check, check, check business rates they are a killer for small businesses who need a larger building and don’t get the same discounts as small buildings. We are seeing a light at the end of a very long tunnel, and if we keep our heads down and work hard we will be on track to continue and expand towards the end of next year. After a tricky time, looks like things are getting back on track for Diane … let’s hope the coming year is a bit more simple! Find out how she was doing in 2015 here. Pat runs gift company Starlight Gifts By Pat, and she’d really only just started concentrating on the gift side when we met her back in June 2013. At that point she was already dreaming about getting out of the day job, although planning sensibly and accepting that might not happen right away: “I would like to have either reduced my day job hours right down or have stopped doing the day job altogether. This is a long-haul dream, not something that I expect to work in a few months.” So, how’s she doing now? No, I haven’t achieved my goal of not having a day job, however I still feel I have come a long was and am steadily raising awareness of my business and building a customer base. I did say that it would be more of a long-haul goal which would not take place over night. So I am happy with how the business has moved forward this last year and hope it carries on over the future. I am still doing events, although not as many so this has only changed slightly, I still have stock in outlets, currently holding stock in three shops although I am a lot more choosy about which outlets I stock. I now choose which fairs to attend and try new locations rather than stay in the same places which I used to do. I have learned that smaller fairs appear to work best for sales, something I did not realise last year when I was doing lots of fairs. I have learned to stop doing events that have lots of resellers, as handcrafted cannot compete with mass-produced cheap items. I now know my target audience and the ideal outlets for my sales. I have also learned that social media is great but you need to be prepared: people will copy your ideas and pass them off as their own. Use fairs not just for sales but for promoting your business and always dress your stall well: after all, it’s your shop front so be creative. Promote , promote, promote and be prepared to change the business in response to what your customers want. And … where do you see yourself and your business in (another) year’s time? Hopefully the business will continue to grow and I will be looking for more outlets to sell from and reduce the number of fairs again. I want to try selling online at some point. I would like to think that eventually I will reach my goal of using my creativity to make a living. It sounds like Pat has had a few issues to contend with this year, however she’s taking the very sensible approach of evaluating what she does and constantly checking that she gets value out of what she does and pleases her customers, an attitude which should provide her with a very good backing over the next years of operation. Let’s hope she’s managed to reduce those day-job hours this time next year! Find out how Pat was doing in 2015 here. If you’ve enjoyed these interviews, please see more small business chat, the index to all the interviewees, and information on how you can have your business featured (I have a full roster of interviewees now so am only taking on a very few new ones). If you’re considering setting up a new business or have recently done so, why not take a look at my books, all available now, in print and e-book formats, from a variety of sources. Today I have a guest post with a difference – an infographic, for the first time on this blog. It’s from writer and infographic specialist Ivan Serrano, and talks about many different kinds of social media and how to interact with them. It acts as a complement to my more detailed social media posts. “Have you seen what (insert important person or business here) posted on (insert social network here)?” seems to be a question that people hear quite often nowadays. Depending on how you word your message and conduct yourself on social media, it can go viral and your business can get brand recognition, or, on the flip side, it can go viral for all the wrong reasons. That’s why it’s important for businesses to conduct themselves properly on social media. In addition to following general social media etiquette, certain social media networks have their own rules of etiquette as well. Businesses must remember that they have a reputation to consider—one inappropriate tweet or post could leave your reputation reeling, and that may take quite a while to recover from depending on how well you handle it. The infographic below gives you a guide on how to present yourself on the numerous social media networks. Ivan Serrano is a writer and infographic specialist from Northern California. Ivan covers topics ranging from global business to tech and social media. He is an avid “Bay Area” sports fan and tries to attend as many games as possible. Hi, Kathy, so, are you where you thought you’d be when you looked forward a year ago? Yes, and more so. This past year has been really good. Still more development needed (isn’t there always? ), but I am really happy with progress over 2013/14. I have had the opportunity to work with some wonderful people this past year and I am looking forward to all of the other lovely people I will have the opportunity to assist in gaining secure, repeat, profitable income in the next 12 months. I made two big decisions. Firstly, to move away completely from groups / organising my own training and development courses (I only do these now when booked by external organisations). Secondly, to stop offering ‘by the hour’; now people work with me for either full or half days. My biggest learning has been really getting to grips with knowing, understanding and working with the numbers in my business. Knowing (and owning) my own value, as well as keeping a firm hold on costs, is having a significant impact on my bottom line. 2. Get a mentor who is interested and involved. My business is mentoring / consulting but I still have a mentor who acts as a sounding board as well as source of inspiration, ideas and a spare pair of hands. Some good points from Kathy there – I’m always amazed when I watch those Dragon’s Den type programmes and people don’t know their own numbers. It’s only sensible to keep your records up to date and keep an eye on the income and outgoings, especially if your business incurs the type of expenses that need to be watched. It’s great that Kathy’s finding time to keep her fitness up, too – I’d add “faster” to her plans for the upcoming year!